PG-58 Pressure Test Gauges: Izumi Products. 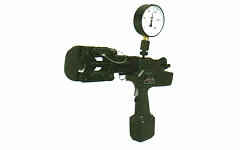 The PG-58 was designed to measure the inner pressure of battery operated pistol type tools like REC-420, REC-S424, REC-S440, REC-485YC, REC-5PDF and REC-UC6E. It is attached to the top of hydraulic body by removing the plug and replacing it with the PG-58. When the tool is activated, inner pressure increases and direct reading of inner pressure is obtained.